Luens are the physical embodiment of goleuni, and this here is a fire one. Nowadays the leuni doesn’t completely take over a being, but it’s still inside. I haven’t updated in forever. Here’s some writing. Husk bore no grudges against the living. Her pursuit was of knowledge, not vengeance. She remembered few of the things he learned, however. This, in part, is what kept her from seeking any retribution for what the living had done to her. Why seek revenge, she reasoned, when I don’t even know if I was wronged? The living allowed her to walk among them, but not unmolested. Children would throw rocks or rotten food at her; the grown would give her dirty looks or turn away. A few of the young would confront her, she was told, and beat her into submission. She never remembered these encounters. Husk was not what they considered a “person.” All she knew of her life was relayed to her by those that hated her. She had no idea of her own history, and so she could not deny any of their accusations. They told her that she was born dead and should have stayed that way. They said her mother used unnatural magic to bring breath into her lungs. They told her that if she was meant to live in this world, she would be able to remember it. They told her she should leave this world as soon as possible. “You are dead yet you walk the roads,” they would say to Husk. She believed them. She could see well enough that her skin was dry and clinging to her meager frame. Her gait was a shamble, slower even than the elderly matrons who tended the gardens. “You are dead yet to speak to us,” they would say. Husk knew the sound of her own voice and how it rasped against her peeling throat as she exhaled. She knew it was not a pleasing sound to the living, and so she kept it to herself a much as she could. “You are dead yet you read,” the meddyg would say to her. “Reading is not a skill many possess here.” The meddyg is living, Husk noted, and does not hate me. Meddyg Yu-Isu provided Husk with much reading material. He showed much patience compared to the none-at-all the other living showed her. He had no problems at all providing her a book he had already read three time over; he understood her mind was fragile. He knew she was prone to forgetting things, especially when she is damaged. “Yu,” Husk whispered, looking up from her book. The skin on her neck crackled as she moved. Yu-Isu turned from his stitching to face his patient. “Pardon me a moment,” he said to the horrified man. “I didn’t even know that thing was here,” the man said, a look of utter disgust on his face. “I read thi—” she started, but shut her crackling lips on the word. She shook her head softly, indicating to Yu-Isu yet again that she’d forgotten what she was going to say. 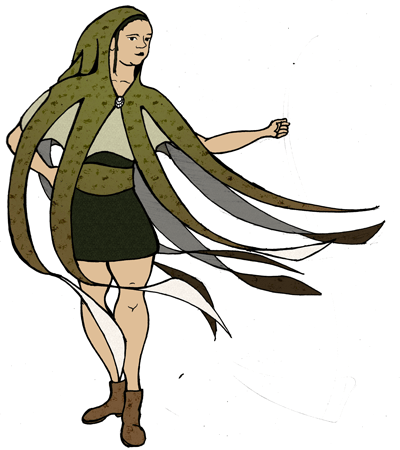 Meddyg Morlawe fashioned her meddyg robes into a squid hood. Though I walked ahead of Cefin and could not see him struggling, I heard increasing instances of dirt and gravel slipping under his feet. He needed to rest again, but would not admit it. He had walked for hours before coming to my home, and now I have made him walk several more. “Let’s rest,” I said, and I heard him sit on the cave’s floor before I’d even turned around. When I did so, he looked tired, shaken, and cold. I traded a packet of pumpkin seeds for a warm cauldron of stew. The seeds were an abundance afforded me by living near Dref Pumpen, the village Cefin presided over peaceably for a dozen years. The stew was a specialty made by a fire mage living in Tan from his abundance of rattlesnakes. Years of knowing me and what I do apparently didn’t prepare Cefin for the sight of me removing a steaming black iron pot of food from a satchel that could easily hold no more than a couple books. I admired the look of shock on his face for a few brief seconds before I handed him a spoon and said, “Eat up. I didn’t get any bowls.” Thankfully he was hungry enough to not ask what the meat was. “Oh come off it,” Cefin replied. “You don’t have to tell me everything, can’t you just describe it a little? Brayden very much wished to attend the great college of wizards. He was not, however, invited to do so. He resolved to gain entry through illicit means and become a self-taught magician. His first attempted approach to the grounds was under the cover of night. He meant to scale the walls at what he scouted to be an unwatched edge. He soon found that the statues standing sentinel over over the walls were in actuality very patient golems. His second and fifth attempts involved unsuccessful bribery, while everything in between involved digging. One may begin to surmise why he was not invited. Brayden continued to monitor the entrance to the college, hoping that inspiration would hit him at some point. It did one fine spring day when he saw a young woman exiting the college grounds riding in a carriage. Though he saw her for only a brief moment, the image of her blonde, curly locks and soft, pouty lips stuck in his head. She looked to be everything he’d ever wanted in a woman and just looking at her filled him with a sense of desire. He immediately set off to follow the carriage. As he stepped off, a hand grabbed Brayden’s shoulder. “You don’t want to do that,” a woman’s voice said. “Andy why not?” Brayden asked as he turned. His eyes first focused on her body, she was dressed in student’s robes that looks a size too small for her bust. He raised his eyes to her face and found himself looking at something quite the opposite of the vision of beauty he’d just witnessed. Her head was hairless and tiny horns protruded from her forehead. “Because that was a man,” she said. “Catalyst,” she said, and offered an open hand. “What?” Brayden instinctively shook it. “It’s my name,” she said, breaking the handshake. “Besides briefly lust after a cross-dressing man?” Brayden asked. Catalyst had walked them to some stone benches in the shade of the wall. The sun was getting low and soon the whole front courtyard would be covered in shadow. “Go on, tell me,” he said as he sat down. Brayden was confused by this at first, but he soon felt a piece of information bring itself to the front of his mind. It was like trying to remember a dream. He had everything there except the words to complete the thought. “You aren’t supposed to do that,” he said. “I just d—” he paused, how did he know? It dawned on him quickly. “You told me when you took my name.” Brayden laughed as he rested his forehead in his hands and placed his elbows on his knees. “What do you want with me?” he said after a moment.